Hello! My name’s Eugénie. I’m a photographer from Portland, Oregon, and for the past two months I’ve been on the road, traveling in my truck from Portland to Alaska, by way of BC’s mainland and the Yukon. This is my final post for Modern Farmer about the trip. It’s been an inspiring adventure. You can see the rest of the story here. It’s a Saturday morning, and I’m standing in the rain next to a guy named Dave. 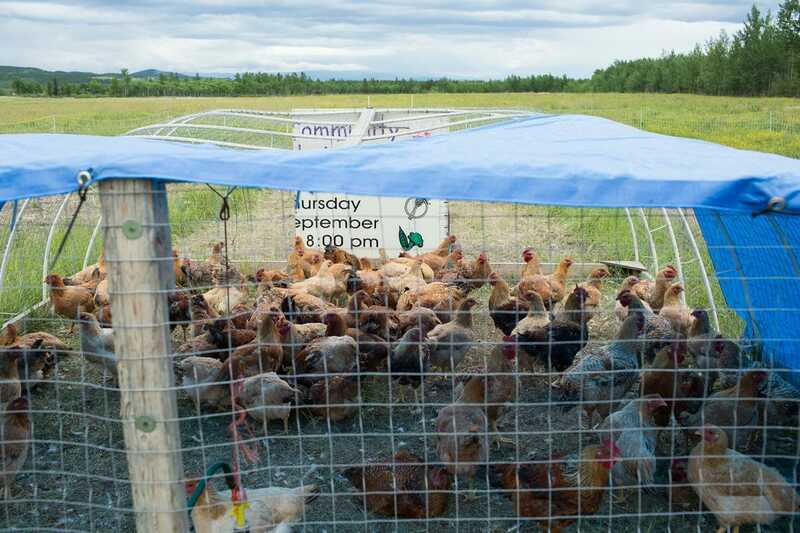 “If I die,” Dave says, “And come back some day as a chicken, I’d like to live and die that life at Aurora Mountain Farm.” We happen to be standing at that very farm, just outside of Whitehorse, Yukon Territory, and while telling me this, his hands move deftly across a chicken carcass, eviscerating it in a few quick moves. I figure he knows what he’s talking about. 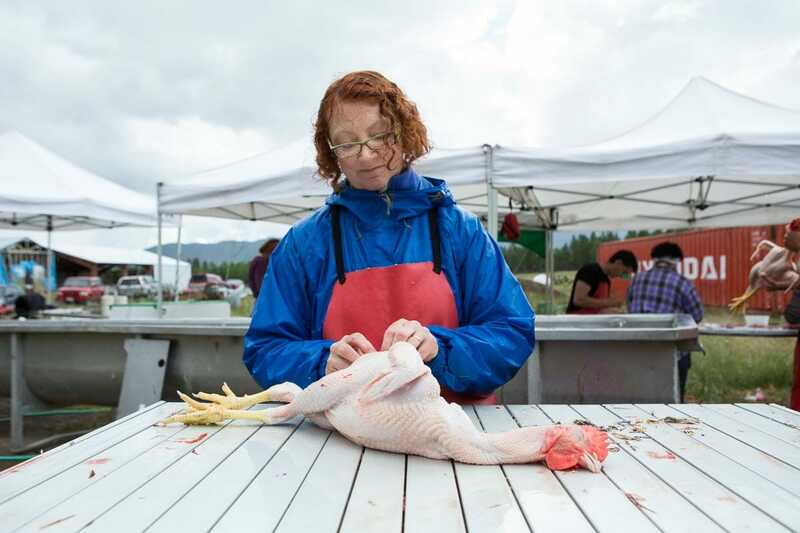 The farmers behind this great chicken oasis are Simone and Tom Rudge, natural-born teachers, every activity at Aurora Mountain an opportunity to learn. Time to feed the pigs? Let’s discuss why you can’t sell a pig as organic if what it eats isn’t. Toss a Cashmere goat some broccoli? Let’s talk about how a buck goat makes himself more desirable to the females by stinking himself up real bad, smelling more goat-ish every day (a skill at which their buck was excelling). Given the educational spirit of the place, it was fitting to see a group of volunteers working cheerily in the rain on the day of their farmgate poultry abattoir. If I were a chicken, I’d want to live and die here, too. The abattoir’s outdoor setup processes their free-range birds start-to-finish, from slaughter with an electric stun knife to scalding, de-feathering, eviscerating and packaging. The volunteers working the stations are, in most cases, the customers as well, and at the end of the day they’ll be taking home their year’s supply of bird. The Rudge’s purchased the abattoir through a Canadian federal ag fund called Growing Forward, receiving $30,000 in funding on the condition that they write a manual on how to use the abattoir, and teach other regional farms the ins and outs. Now six participating farms share the portable setup and support each other on processing days. On this day, they had to get through 200 birds. Simone assures me they’ll be done by afternoon, but given all the quick hands on deck, I’m guessing they finish early. The Yukon flies fast, and soon I’m in Alaska. I skip the city, and head straight for the bush. 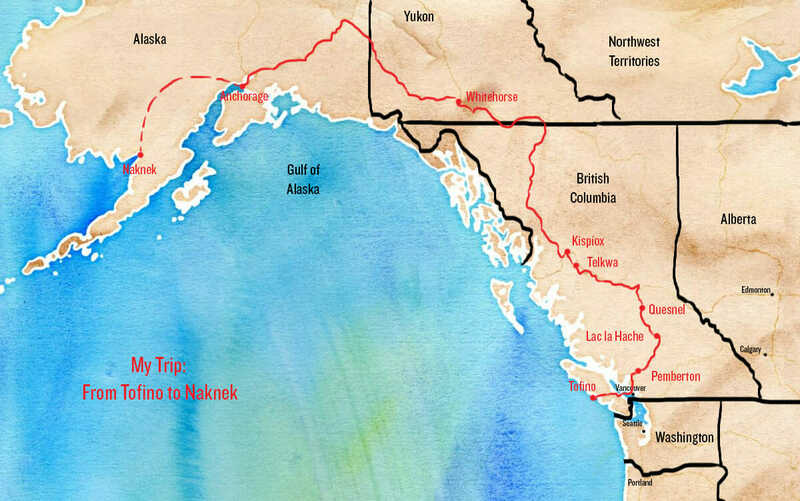 Here, they say that roughly 95 percent of the food Alaskans eat comes from outside of Alaska. If not wild harvesting, then one is likely paying a premium for imports that are no longer fresh by the time they arrive. So what’s the alternative? To find out, I fly to the small town of Naknek in Bristol Bay, and meet up with Corey, a photographer and commercial set netter. We’re off the road system, so we load his skiff with two weeks of provisions and head up the Kvichak River, Corey chasing the spawning Sockeye for his ongoing photo work on Pebble Mine, me on the hunt for signs of farm life in the wild, a somewhat challenging mission in a region where villages are few and far between. Mostly, it’s tundra. 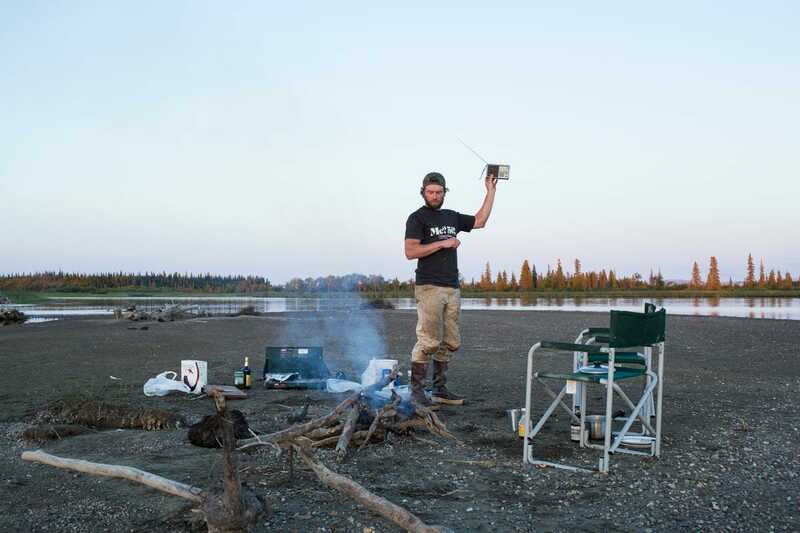 And a bit of public radio, if you can get a good signal. But where there’s soil, water and light, there can be veggies. Small greenhouses and high tunnels help. In the native village of Igiugig (pop. 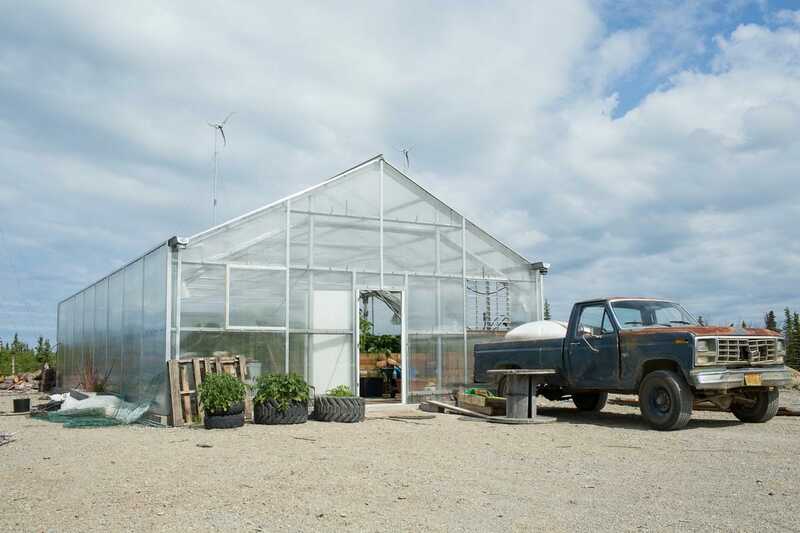 69), the Village Council, led by 29-year-old AlexAnna Salmon, installed a state-of-the-art greenhouse, complete with windmills to offset its energy use and an automated watering system. Still in testing phase, this summer the greenhouse was brimming with tomatoes, cucumbers, peppers, green beans and herbs. For now a volunteer maintains the site, but the Council’s on the hunt for a WWOOFer. Anyone want to move to Igiugig? There’s a lot of potential here. 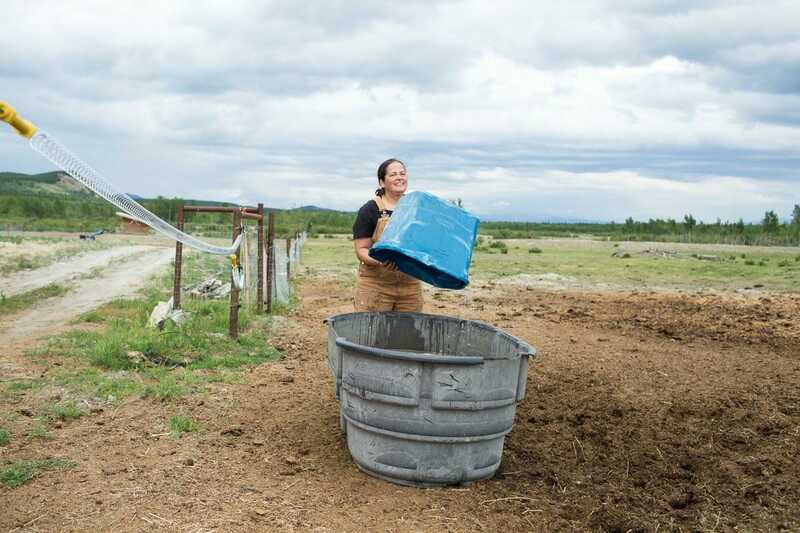 Across the road, Rhiana Nuñez proudly showed us around her family’s small subsistence setup. 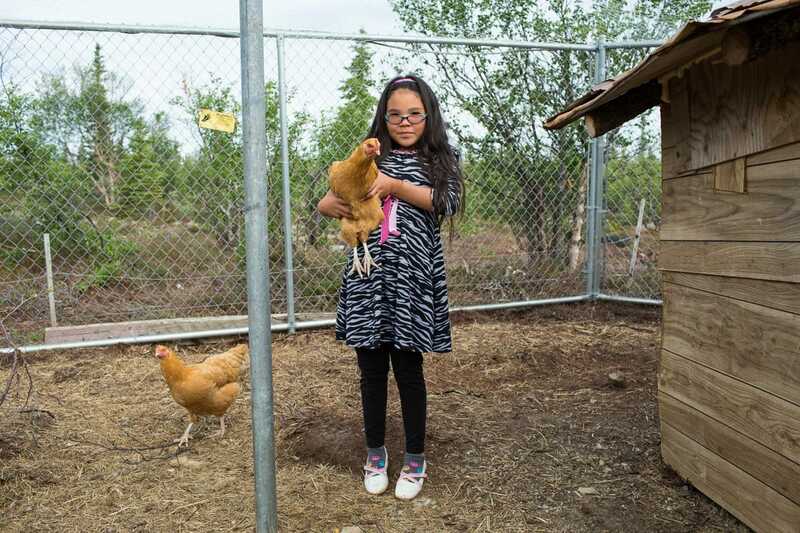 Chickens, pigs and rabbits live clustered together and provide protein throughout the year for this family of four. 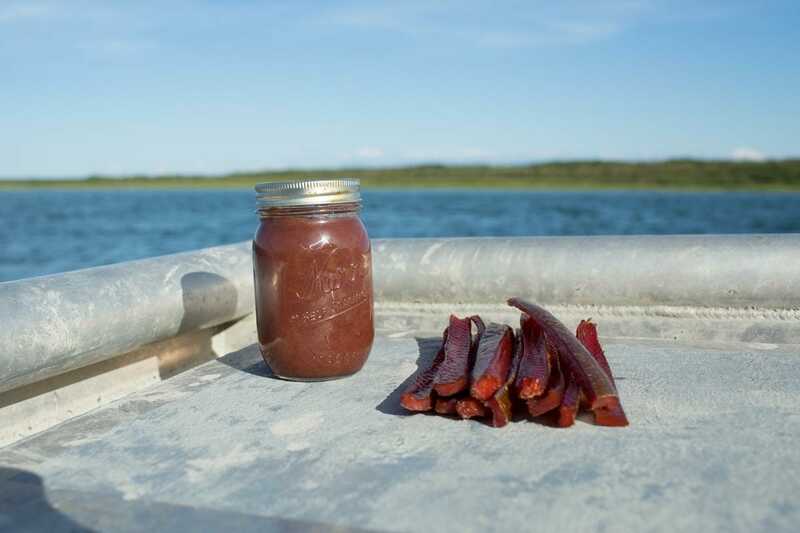 East of Igiugig, down Iliamna Lake, the native village of Kokhanok was undergoing a fresh-food revolution. 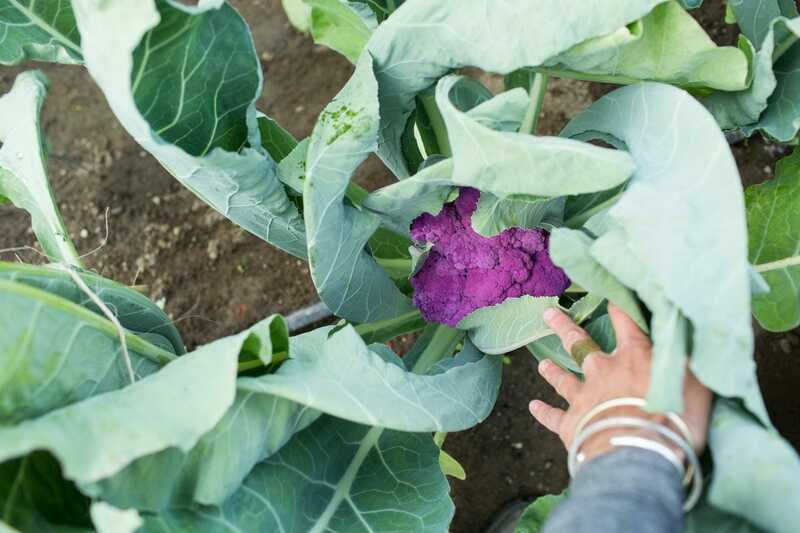 We’d heard about it from AlexAnna, how two teachers, Colter and Jenny Barnes, had begun providing healthy seasonal food for the village of 170 people. “The people seem more proud of their village than they used to be,” she’d said. We anchored, asked around, the locals said just look for the yurt, then someone threw us on the back of her ATV, and we were there. 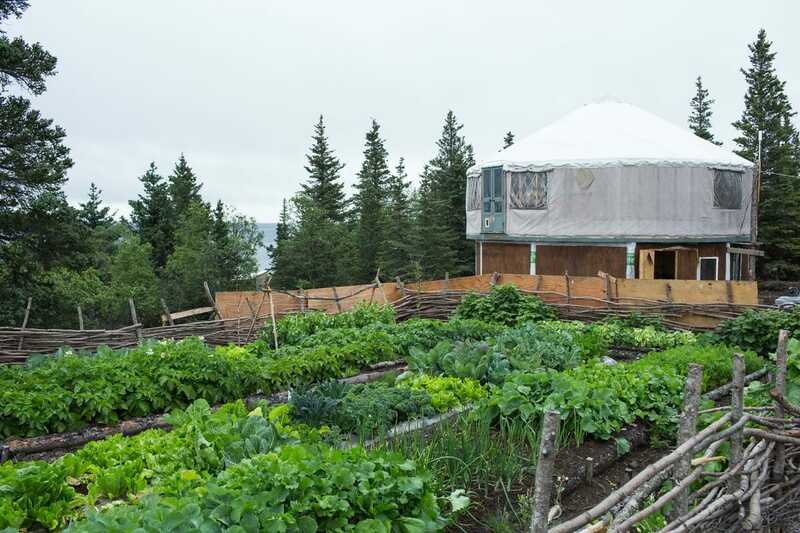 Colter humbly swears he doesn’t know what he’s doing, but you don’t get an acre bursting at the seams with hearty greens, root vegetables, chickens, goats, pigs and bees by accident. Colter’s property teems with life. 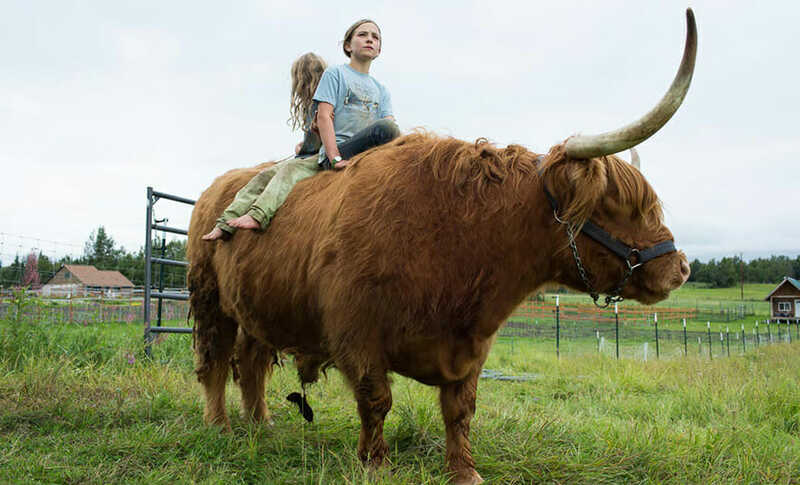 Kids from the village stop by to see the animals, and a steady stream of WWOOFers roll through from March to December. Locals come weekly to buy boxes stuffed with good eats: goat milk and yogurt, homemade jam, something pickled or preserved, freshly baked bread, eggs, generous bunches of greens, it goes on. All from the hands of Colter and friends. And it’s at Kokhanok that it hits me. Eating fresh vegetables in the bush isn’t hard, technically. Sure, the season’s shorter, but the sun’s out all summer, and the soil’s good. It just requires that certain someone. The one who looks out at the tundra, and doesn’t see a vastness of low-lying shrubs and mosquitoes, but sees potential, there under the spongy surface, and digs in. Duh. It’s the mindset of a farmer. There are a few hiding out there ”“ the AlexAnnas and the Colters ”“ and there could stand to be a few more. Back in Anchorage, I head north along the Matanuska River to Chickaloon, to check out Chugach Farm, owned and operated by Allie and Jed Workman, climbing guides who started homesteading in 2003. Everything here is done by hand, from broadforking the soil to chainsaw milling the lumber. Burly and ambitious, the Workmans wanted to see how much productivity they could get out of less than an acre of land. Turns out, it’s quite a lot, and they now service the Bear Tooth Grill in Anchorage, the Spenard Farmer’s Market, and five CSA shares. The farm’s off the grid. 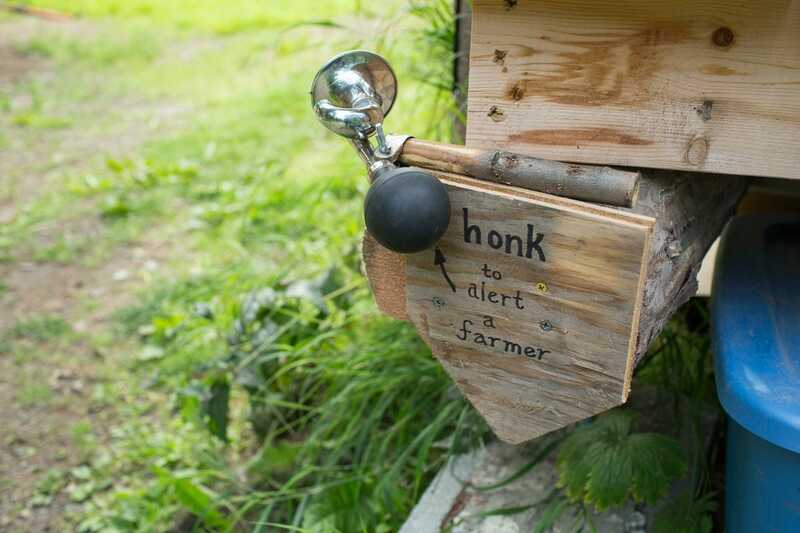 If you need to find a farmer, just honk. They sell an assortment of value-added products, including kombucha, vinegars (medicinal and culinary), dried herbs, herbal tinctures, pestos. I showed up on baking day. 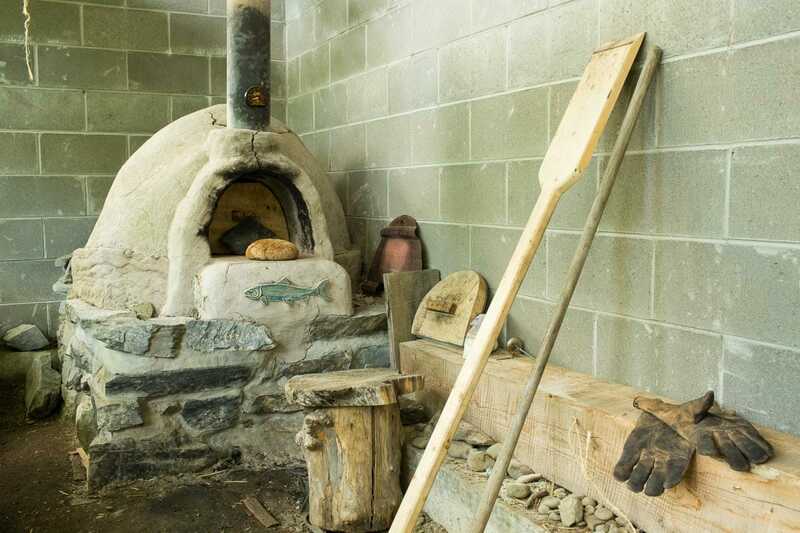 The clay oven, tucked in a corner of their greenhouse, is wood-fired, and sent aromas of campfire mixed with fresh-baked bread wafting across the farm. Purple cauliflower. How cool is that? Allie’s vegetables were beautiful. She’s spending a lot of time with them, and it shows. Allie sends me off with an armload of kale. Munching on the greens while driving back to Anchorage, I think about all the other gifts I’ve received while on the road ”“ bushels of carrots, lettuce, beets, kohlrabi; jars of rhubarb and strips of dried salmon, side-of-belly, the best cut; offers of guest rooms, couches and living room floors; caribou steak in a special marinade; hot cups of coffee, cold pints of beer; even a half dozen eggs, bundled in a white paper towel and left on the hood of my truck. All this kindness. How do they have the time? Or the spirit? But that’s the thing. They just do. You can definitely farm in Alaska. And the vegetables do get big. They’re huge this year. 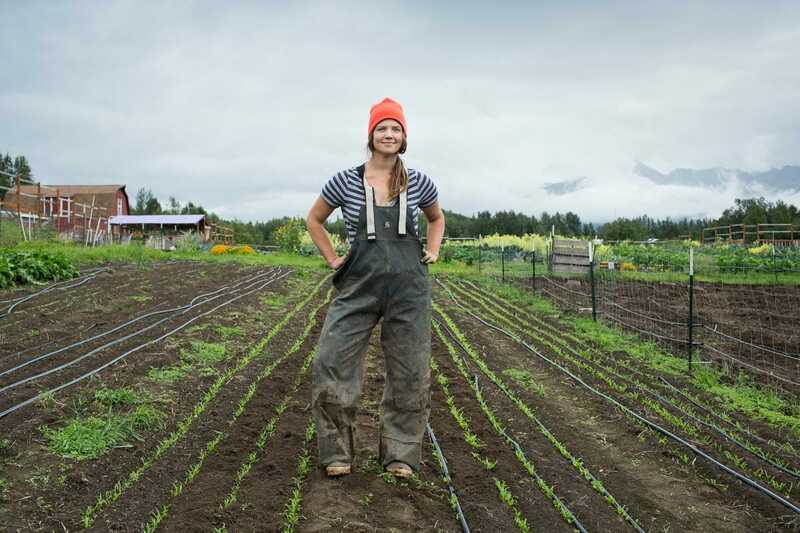 But as with most places, the state could use more young farmers. I spot some young recruits in Leila and Trillium, daughters of Anne-Corinne. They pull me around their farm breathlessly, swinging on tall gates, scrambling over fences, shouting down from the roof of a shed about the merits of their pigs, their draught horse, their donkey. 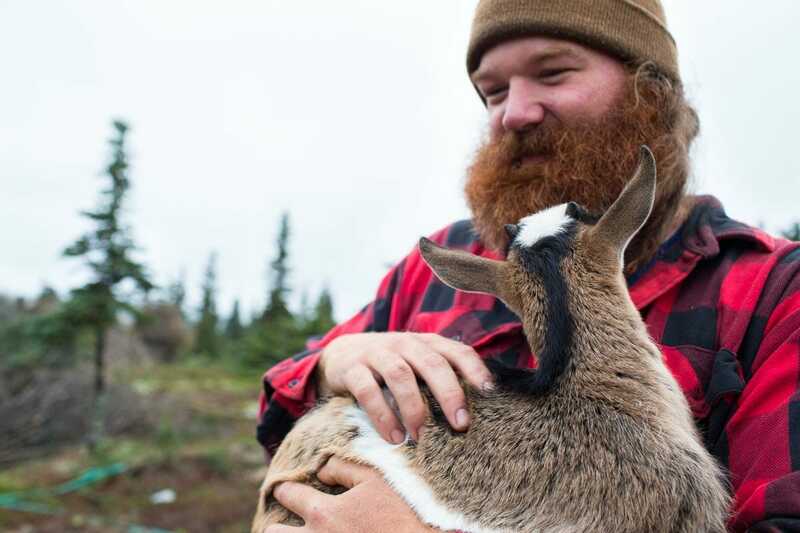 I would very much like to see these two become the future farmers of Alaska. 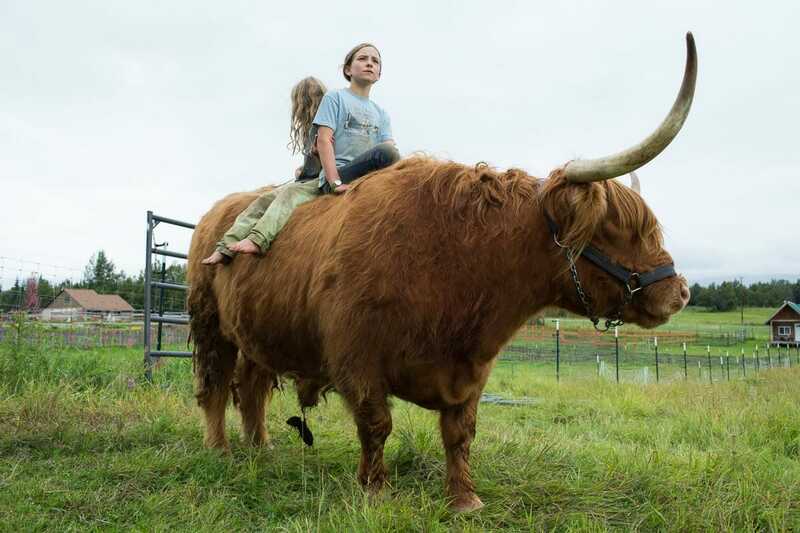 They’ve got everything it takes, from a preference to tear around the fields barefoot, to the ability to scale a Scottish Highlander bull. Leila is all for it. Trillium on the other hand, she’s got other plans. “I want to be an airplane mechanic,” she says, and looks off into the distance, possibly seeing herself there. That’s alright. What is she, eleven? She’s still got a bit of time to change her mind.